Now begins the most crucial part for the making of fine chocolate. Fermentation is the first critical process to develop the beans’ natural flavours. 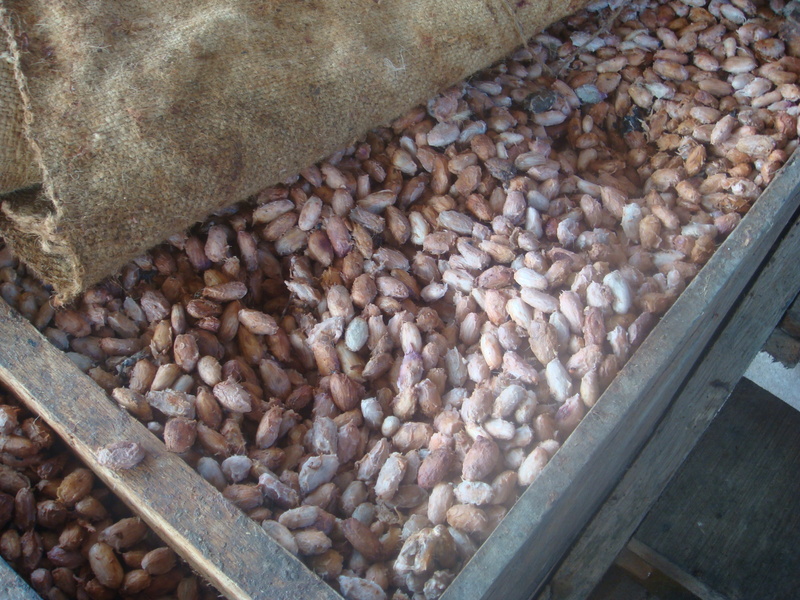 The beans and its pulp, are immediately placed in large wooden boxes, otherwise known as “sweatboxes” or “modulos” in Spanish. 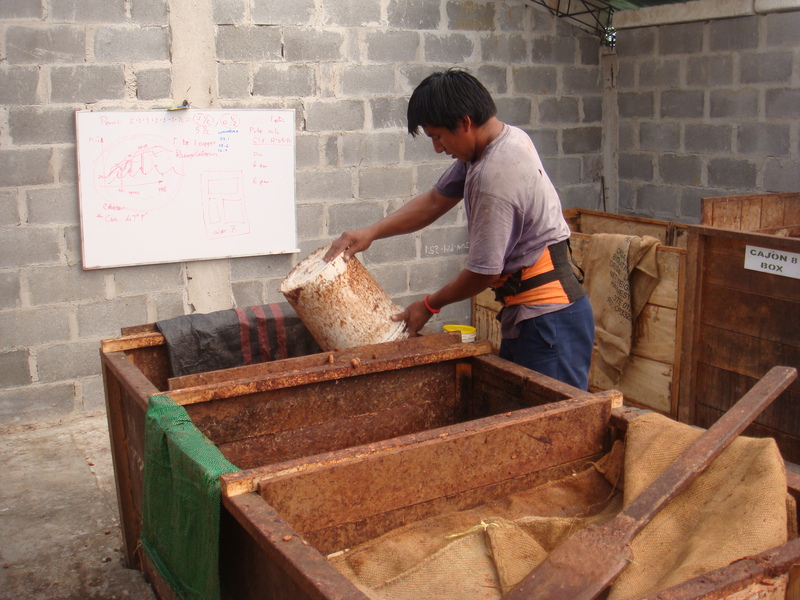 Each box contains approximately one ton of beans and are built out of wood, as wood is conducive to the fermentation process. The holes in the bottom allow aeration and drainage. The white mucilage-like coating around the bean provides the sugar for the fermentation process that each bean will undergo. The beans are placed in the first box, where they will remain for 48 hours, from there the beans will be moved from one box to the next, until its fermentation process is complete. 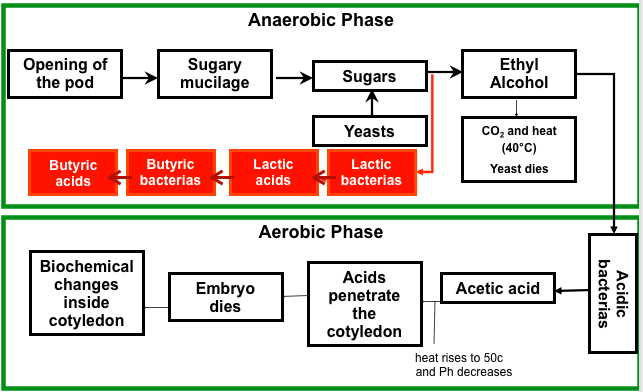 The first 48 hours is the anaerobic phase during which the yeast and the pulp surrounding the beans are transformed into alcohol and carbon dioxide. As the temperature begins to increase to 40C an exothermic reaction begins to take place during which lactic acids begin to form, and as the pulp begins to disintegrate, air begins to penetrate. At the end of the 48 hours, the aerobic phase commences, as the beans are turned, aeration allows strong growth of Acetobacter (aerobic bacteria), which transforms alcohol to acetic acid. At this stage the temperatures begin to rise up to 50 C. The bud (or germ) within the cacao bean dies from the heat, alcohol, and acetic acid. When the bud dies, important chemical changes begin as enzymes within the bean itself are released. These are important for the development of the chocolate flavor. As this is all quite scientific, I have inserted a diagram to explain the biochemical changes that occur during the fermentation process. 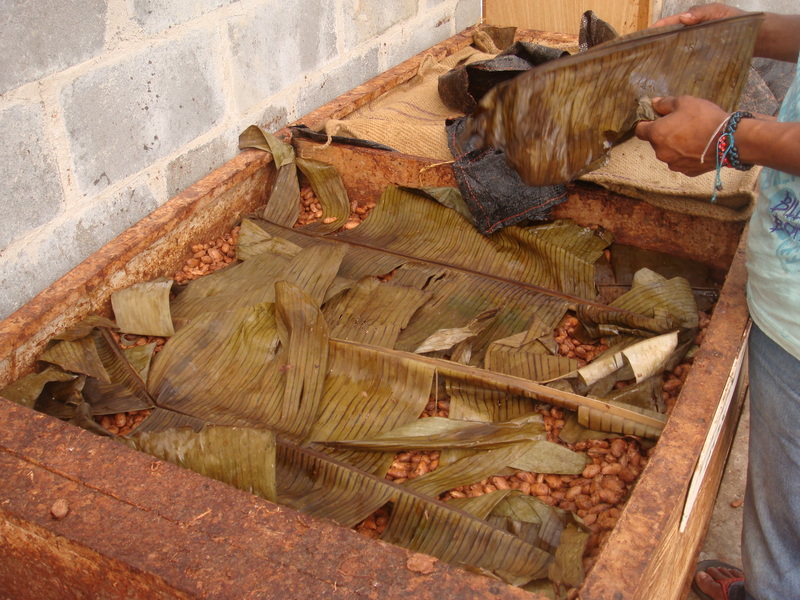 In order to facilitate the fermentation process the top layer of the beans are covered with banana leaves. 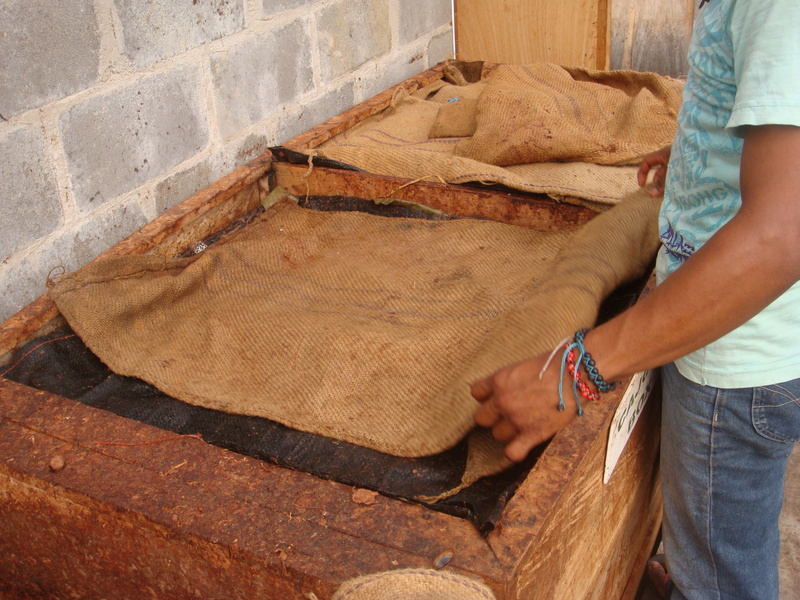 The plastic, covered by the jute bags helps to further conserve the heat, and induce the “sweating” process that the beans undergo. The different layers prevents moisture from being lost. 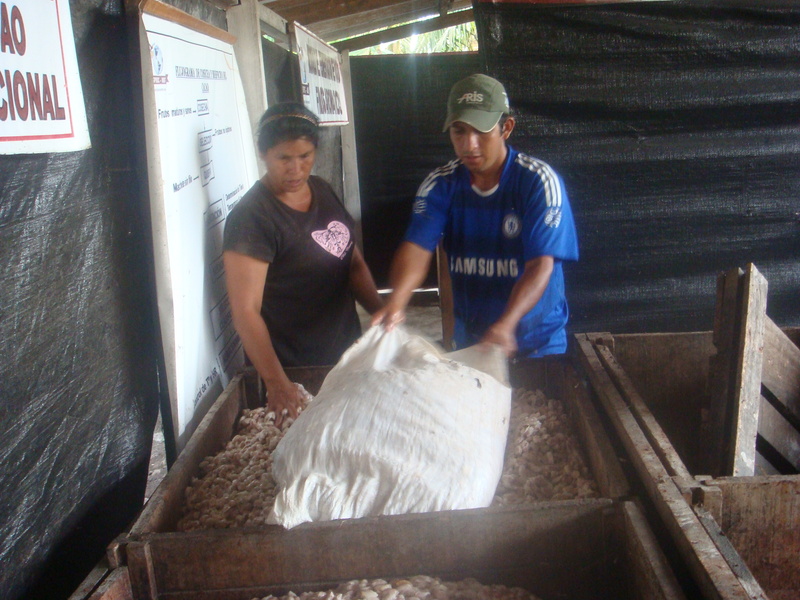 If too much moisture is lost, the cacao will not ferment properly. I am intrigued to understand why banana leaves are used to cover the beans. I am told that the bottom part of the leaf contains natural yeast and microorganisms, which helps to strengthen the natural fermentation process of the beans. Once the 48 hours are completed, the beans are turned with a wooden shovel to ensure that the temperature evenly spreads from top to bottom. 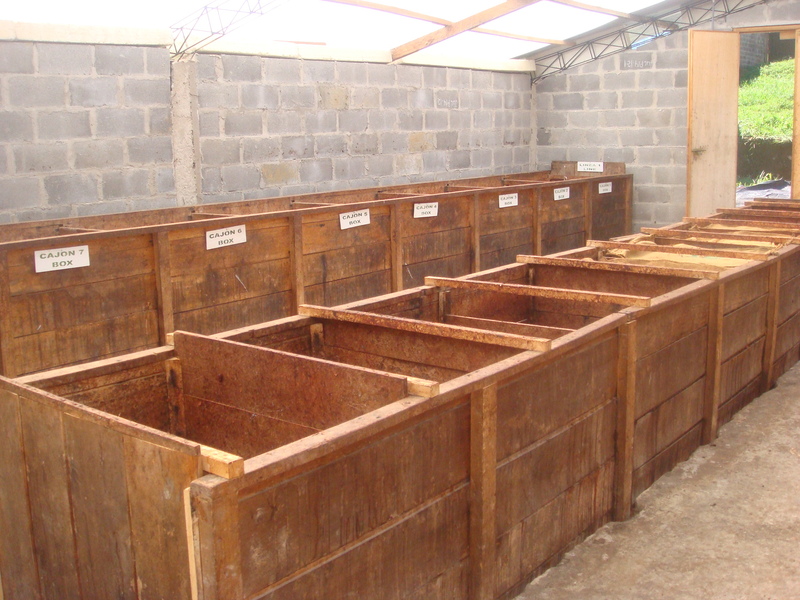 The beans are then moved from one box to the next with either wooden shovels or buckets to ensures that the beans ferment consistently. On the third and fourth day of the fermentation process, the beans begin to reach a astonishingly high temperature of 48 C to 50 C. This is the optimal temperature for a good fermentation and ensures a yield of 80% to 85% of well fermented beans. As I put my hand in the box, it is incredible to feel the heat of the cacao. It is fascinating to see how the beans composition begins to change from one day to the next. 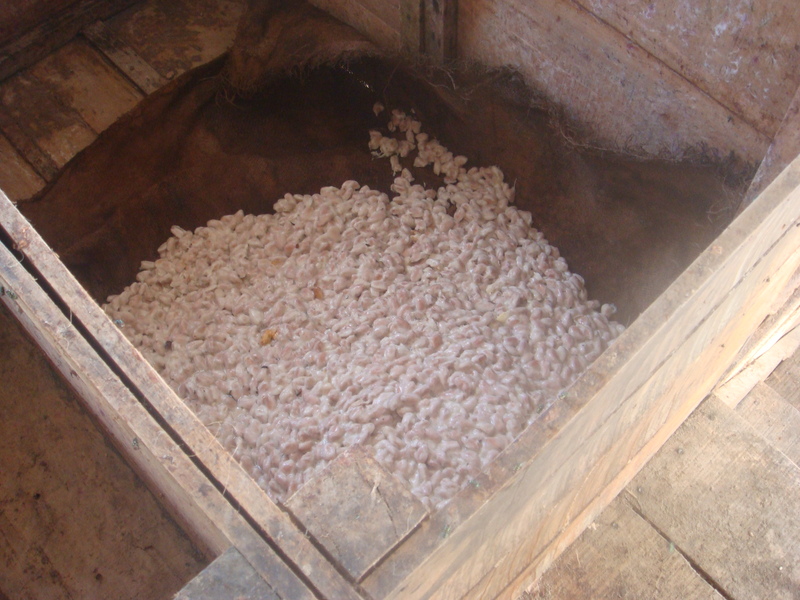 The photos below shows the beans on its third and fourth day of fermentation. 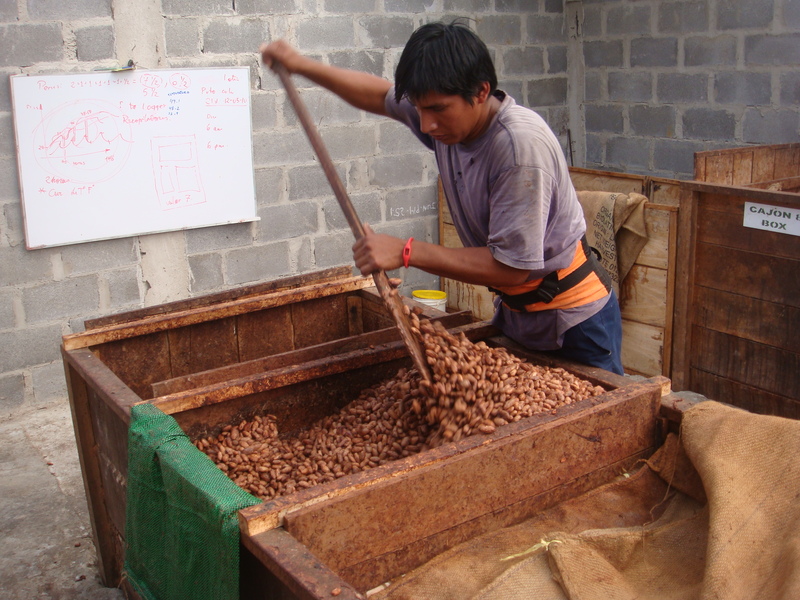 The fermentation process takes anywhere from two to eight days depending on the type of cacao variety. In this case, as the CCN-51 has a lot more mucilage than other cacao varieties, the fermentation process is longer; six days and one night. So why is a good fermentation process vital for the making of fine chocolate? 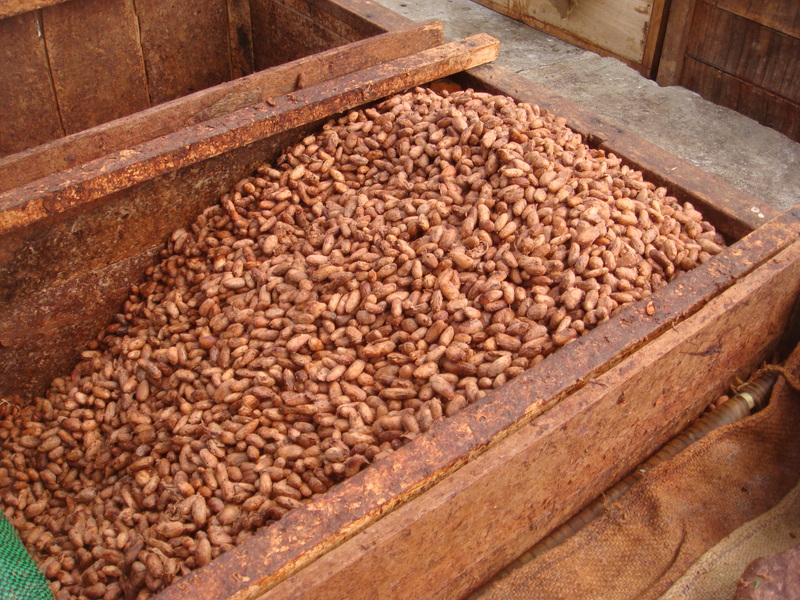 Fermentation helps to remove the natural tannins and acids present in the cacao bean. The amount of tannins in each bean is between five and fifteen percent of the bean by weight. Tannins bring an astringent and bitter flavor to the final chocolate. So the fewer tannins there are in the bean to begin with, the easier it is for the chocolatier to bring out the natural flavors and achieve an optimal flavor profile to make the best chocolate possible. The differences between a non fermented and fermented beans are astonishing. You can very quickly tell whether a bean has been well fermented both visually and from its taste and texture. When the bean is well fermented, the shell is easily removable and you can easily break the bean into nibs. Both the outside and inside of the bean is a chocolatey brown colour. When you taste the bean it has a light bitter taste and a nice aroma. 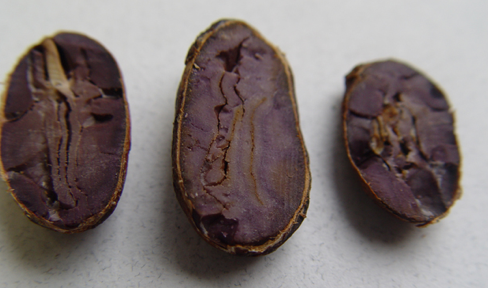 If the bean hasn’t been well fermented, the inside of the bean is purple, as shown below, and has an acidic and astringent taste. 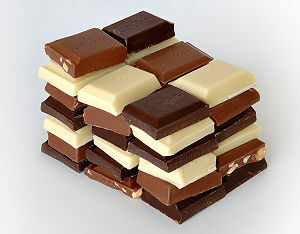 It is surprising to think that some of the world’s leading mass market chocolate companies may buy beans that have not been appropriately fermented, however as the beans are used to extract cacao butter and powder, and where other ingredients such as sugar and hydrogenated fat are added to the chocolate, the quality of the beans in the making of chocolate is not so important to them. 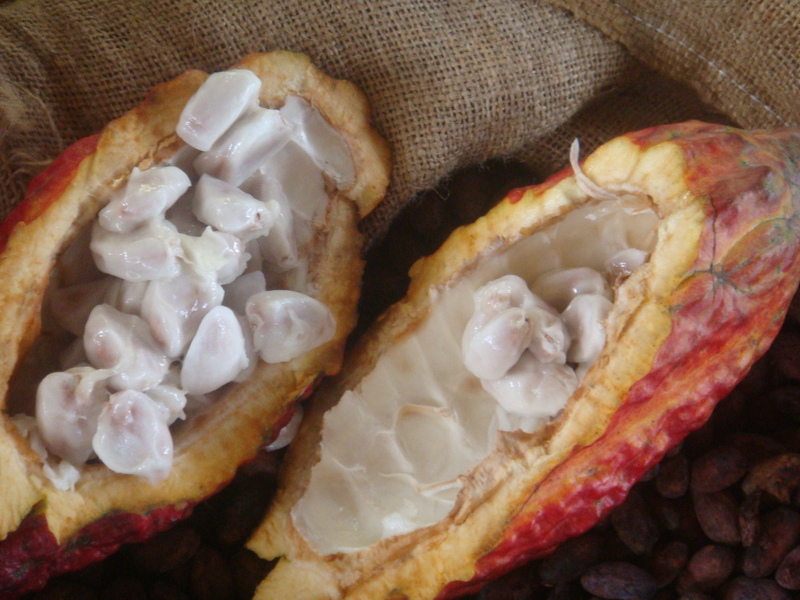 Five percent of the world’s cocoa production is fine quality flavoured cocoa. 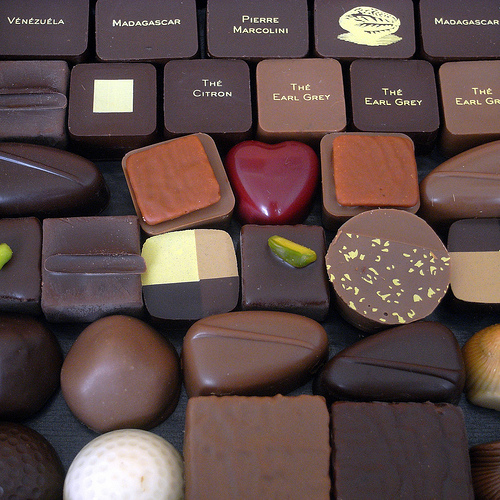 The finest cacao comes from Central and South America, the Caribbean, the islands of Madagascar. Great series. I never knew that there is pulp and juice inside the fruit that can be consumed. And I never realized there is such a long process of fermentation for the beans. I somehow always thought that the beans get ground up just like coffee. Shows how little I know. oh my!! i got so excited when i saw your blog on ‘freshly pressed’. my dad planted several cocoa trees so i’ve been looking up on info online for him. i’m really glad i found your blog! Fascinating. Thanks for all the info. Juliet. I am not very excellent with English but I get hold this real easy to translate. Thank you so much for taking the time to document your learning. I’ve learnt more though your adventures than though the many research papers that I’ve been reading on bean fermentation. I’m curious to know whether you know why wood is conducive to fermentation or if it’s just an inherited artefact. Have you seen anyone using concrete or stainless steel to ferment the beans?